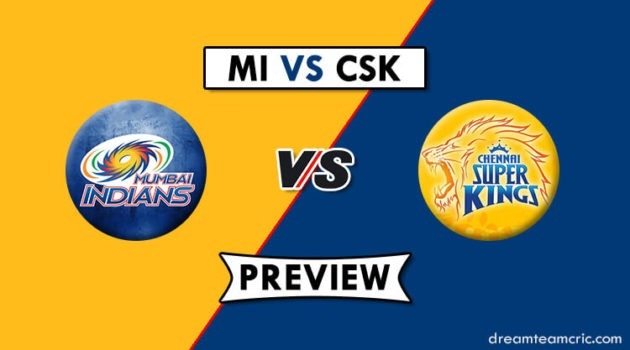 The 23rd Fixture of Indian Premier League 2019 could come out as one of the thrilling encounters in the history of IPL. Two top teams on the points table will roar over each other in the next meeting of IPL 2019. 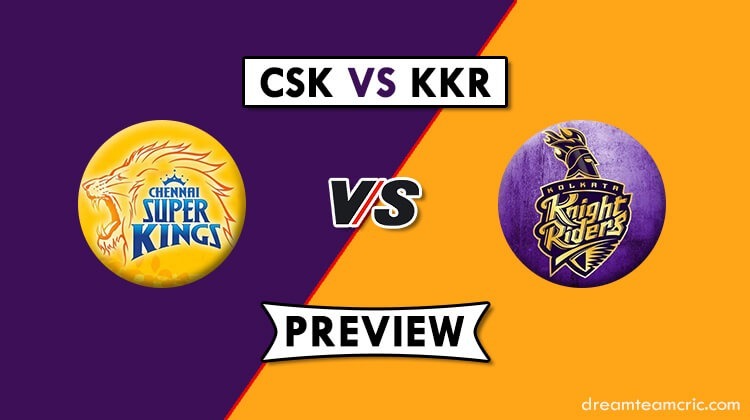 Kolkata Knight Riders will ride to MA Chinnaswamy Stadium on Tuesday to lock horns against invincible MS Dhoni & his co. Kolkata Knight Riders and Chennai Super Kings are achieving victories in every fortress they are invading on. So, we cannot wait for anymore longer for the vast suspense to get unfolded. Both the captains (MS Dhoni & Dinesh Karthik) have led their squad with immense confidence in them so far, so the clash is expected to be extremely dramatic and mouth-watering. Talking about their run in this season, both the teams have won four matches each out of five, but KKR sits on the peak of the points table because of Net Run Rate. Kolkata Knight Riders would step the ground actively after defeating Rajasthan Royals in their last encounter. The opening partnership took a much-needed responsibility and finished off 80% of the game themselves. Other players at KKR are growing vigorously, and it could be a severe concern for other teams in the tournament. On the other hand, MS Dhoni has always been aware of all the weaknesses of his opponents, and this is one major concern for KKR. 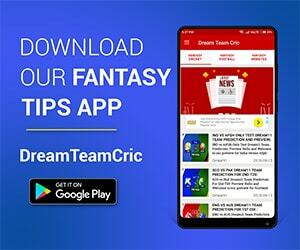 Chennai played their last encounter against KXIP, and Faf du Plessis 54 runs off 38 balls, and Harbhajan’s two-wicket got them an easy victory. This encounter is expected to make new records in IPL history if both the teams come up the same way their fans have dreamt off. The pitch at MA Chinnaswamy mostly listens to the spinner. It is not easy for the batsmen to score runs here. 150+ can be seen on the scoreboard in the first innings. 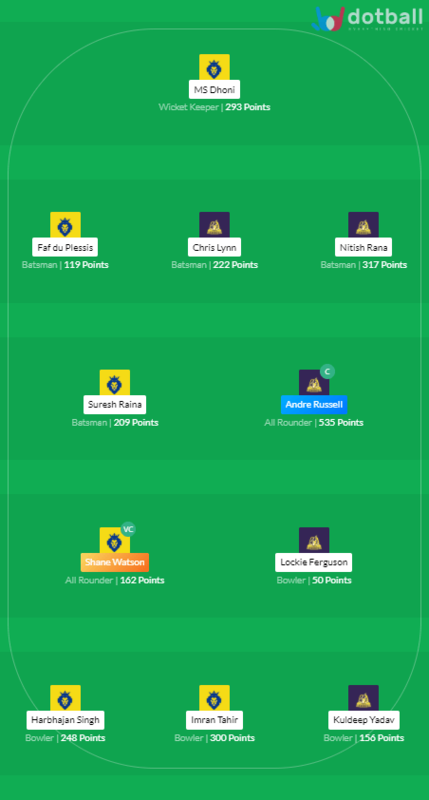 Both the teams are expected not to make any changes to their winning combination. Lynn and Narine have been contributing with their willows. Narine has not failed his team with his bowling skills either. MS Dhoni’s CSK has been running solid since the start of the tournament. Watson and Raina have made some valuable contribution to their team. Harbhajan proved in his last encounter that how he is capable of plucking the top orders batsmen. Dinesh Karthik (C), Joe Denly, Kuldeep Yadav, Lockie Ferguson, Prithvi Raj, Sunil Narine, Andre Russell, Carlos Brathwaite, KC Cariappa, Shubman Gill, Harry Gurney, Robin Uthappa, Chris Lynn, Piyush Chawla, Nitish Rana, Prasidh Krishna, Sandeep Warrier, Rinku Singh, Shrikant Mundhe, Nikhil Naik. MS Dhoni is the best pick as a wicketkeeper. He scores run in every match. Andre Russell, you know has turned beast in this IPL season. Don’t miss him out. Spinners would get help on this pitch. Kuldeep, Imran and Harbhajan are worth betting on.